During a wildfire, time is crucial and resources are limited. Last week, Tualatin Valley Fire & Rescue began deploying specialized equipment and crews as strike teams to assist other agencies to protect homes and property in wildfire-threatened areas. 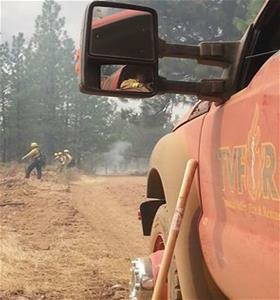 So far, TVF&R has sent 18 firefighters and command staff to assist with fires, including the Cornet-Windy Ridge Fire burning near Baker City that has affected 99,270 acres and the Canyon Creek Complex fire near John Day that has burned 43,738 acres. Oregon has a Conflagration Act allowing the state fire marshal, when authorized by the governor, to mobilize firefighters and equipment from across the state. This occurs when a fire is threatening lives and structures, and is exceeding the resources of local emergency responders. Fires in Oregon are severe enough that federal resources are now assisting local and state responders.